According to many, Porec is the most important tourist center of Istria. Situated on the western shores of the beautiful peninsula, this small maritime city has so much to offer and satisfy even the most demanding of guests. With its cultural sights and beautiful monuments, amazing nature and diversity of tourist services and accommodation; Porec has always been among the most beloved destinations of European visitors. In summer period, at the peak of the tourist season, Porec visitors often outnumber the permanent residents of the city. But, there is no room for concern, Porec has more than enough accommodation capacities to comfortably settle them all. There are numerous hotels across the wider city area, with many four star resorts such as Laguna Parentium, Laguna Albatros or Mauro. If you prefer a more intimate and domestic atmosphere, stay in bungalows or leisure houses in one of the tourist settlements or choose from immensely rich private accommodation offer. And for those of more adventurous and nature-oriented spirit, there are two auto-camps in the wider Porec area. Porec is considered to be the city of sports. Its numerous sports terrains and sports halls are practicing venues of various professional sports teams. You can enjoy a wide range of recreation possibilities during your vacation. Apart from swimming and enjoying the pureness and freshness of the sea on one of the city beaches, you can try tennis, horseback riding, sailing or fishing. The areas around Porec are becoming more and more popular among the cycling community. There are several scenic cycling routes across the wider Porec area ideal to experience the true spirit of the region. If you are interested to learn more about the historical and cultural heritage of this area, Porec won’t disappoint you. 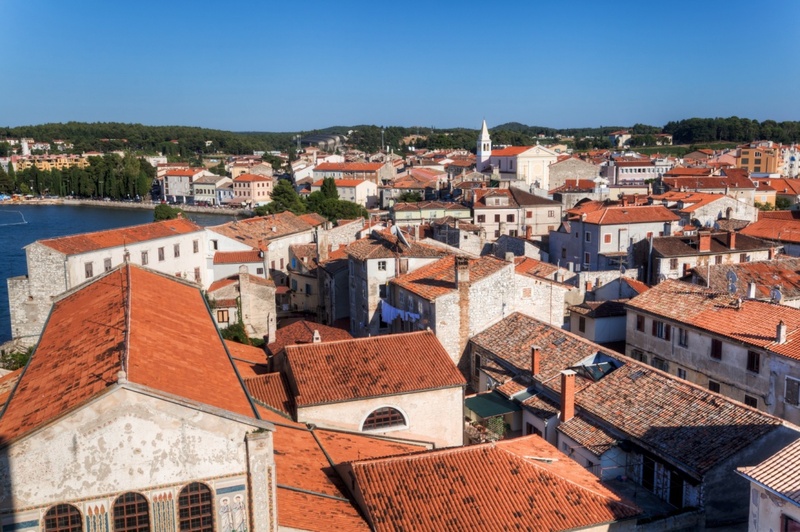 As many other Istrian towns, Porec has had a turbulent, over two millenniums long history. Your walks through the city center will reveal ancient Roman influences in the remains of the original architecture: main streets, forum, The Temple of Neptune and many more. These walks through the city streets may feel like walking through the centuries; it is not unusual to see romanic house, gothic palace, ancient temple and Byzantine church in the same street. Undoubtedly, the most famous monument of Porec is UNESCO protected Euphrasian Basilica, the masterpiece of the Byzantine architecture. As any other Istrian tourist resort, Porec is proud of its rich and colorful gastronomic offer. According to some sources, certain city areas are so crowded with restaurants; there is one restaurant on every 15 residents of the area. Most of the eating venues offer a variety of Mediterranean dishes prepared exclusively of the freshest ingredients. Although fish specialties are certainly most beloved choice for the majority of tourists, it is recommended to try exquisite dishes of the Istrian continental cuisine as well. As a modern tourist resort, Porec has a rich nightlife scene, with numerous nightclubs and bars open throughout the night; but this city nurtures the tradition of street performances as well as dancing terraces under the starry summer sky. The most popular nightclub in these areas is Byblos, often hosting eminent electronic music performers. Find information about selected Hotels, apartments and rooms in Porec to choose the perfect place for your accommodation.